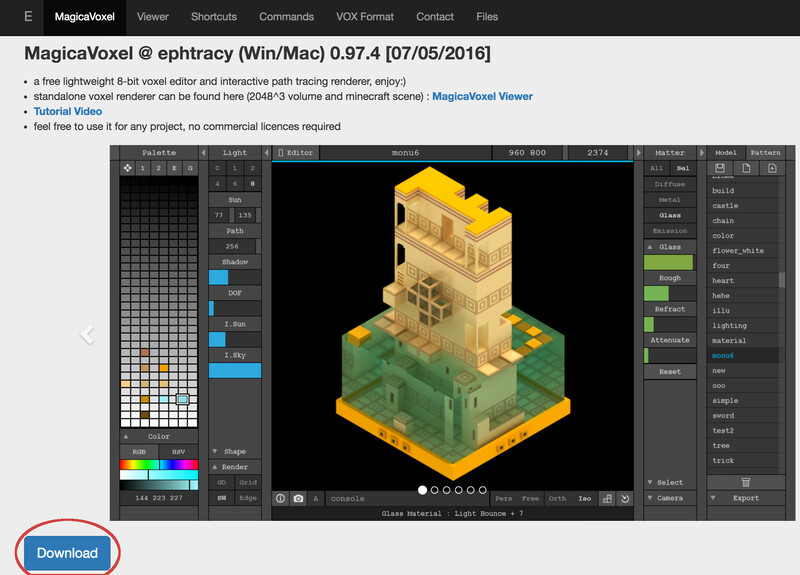 MagicaVoxel is a free and user-friendly tool for building 3D scenes and models using voxels (i.e., blocks). 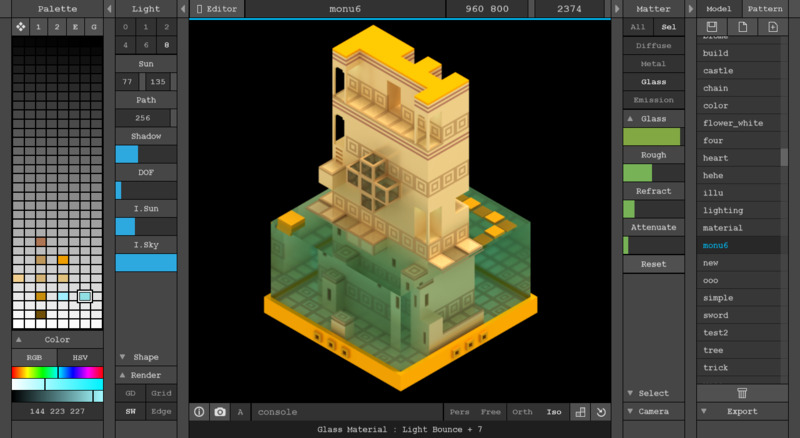 MagicaVoxel makes modeling super easy, similar to building in Minecraft. Alternatively, you can find the MagicVoxel app file in Finder, right click on it, and then choose “Open” from the shortcut menu. 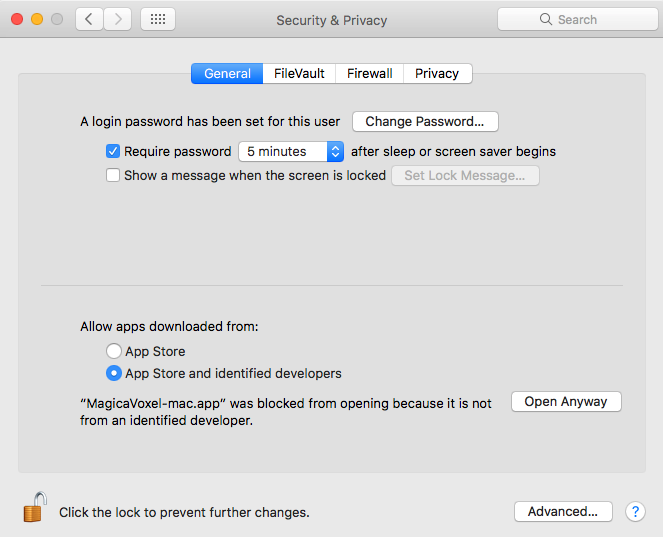 In the subsequent dialogue click “Open” again. For more information, visit Apple’s documentation on unidentified developers. The best way to learn the MagicaVoxel UI is to click around, play with application controls, and pay attention to the tooltips on hover. Many developers are able to create their first scene within a half hour! Given the absence of official tutorials, however, the following serves as a quick guide to navigating the UI. Pan: Hold <space> + <right-click> and move the mouse or trackpad, or hold <space> and press one of the <a> or <d> keys. Rotate: Hold <right-click> and move the mouse or trackpad, or press one of the <a> or <d> keys. Zoom: Scroll up and down with the mouse or trackpad, or press one of the <w> or <s> keys. The top right corner of the viewport allows you to change the bounding dimensions of the model. Note that in MagicaVoxel, the XY plane is horizontal and the Z axis points up. 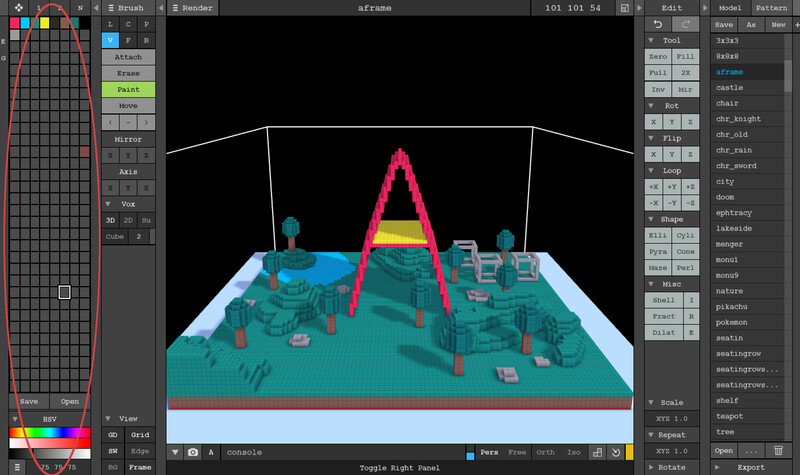 V (Voxel): Works on individual or discrete groups of voxels. F (Face): Works on groups of adjacent voxels that are the same shape or color. B (Box): Works on a 2-dimensional box of voxels where we control the area of the box by dragging. L (Line): Works on a 1-dimensional line of voxels where we control the length of the line by dragging. C (Center): Works on a circle or square of voxels where we control the radius of the shape by dragging. P (Pattern): The pattern brush lets us use other MagicaVoxel models and paste them into the current model. Useful for placing repeated shapes. Paint (g): Change color of existing voxel(s). Move: Moves entire model. Unfortunately, there is no way to select individual voxel(s) to move. Below the actions are three color picking tools to pick, remove, and place color. 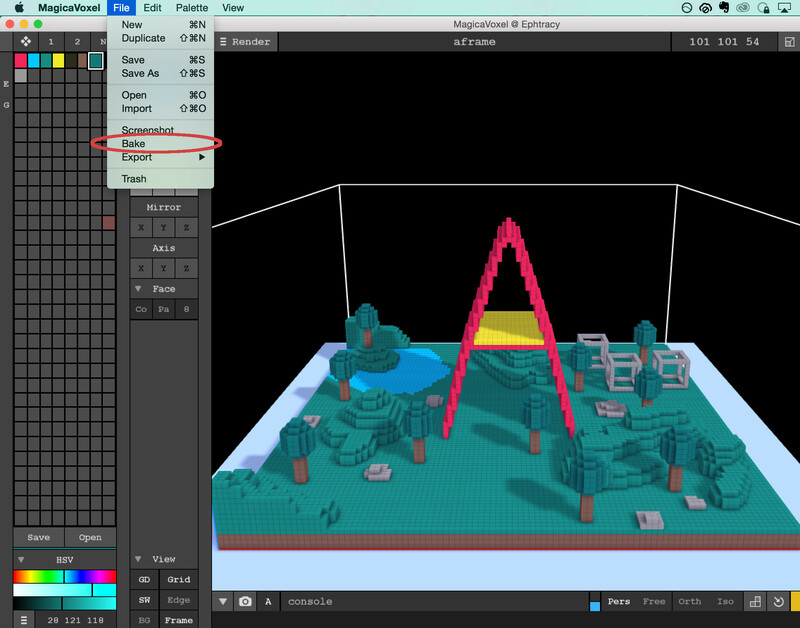 It is useful to know the <alt> + <click> shortcut to select a color by clicking on a voxel. After creating your model, you can export it to an A-Frame scene for the world to see! We recommend exporting to either the .PLY or .OBJ formats. The PLY format produces a large file size but includes baked shadows, meaning the rendered shadow colors are stored in the file. The A-Frame scenes shown above produce a ~5MB file size with baked shadows. It depends on your desired constraints whether or not file sizes on this order is tolerable, but exporting with baked shadows will look visually great in A-Frame. The .OBJ format produces a much smaller file size than .PLY, but MagicaVoxel does not support baked exports to .OBJ. Exporting to .OBJ will also produce a .MTL for the colors and textures. You will need to include both and put them in the same directory as each other. We will later try to produce guides to baking lightmaps and shadowmaps into the .OBJ using Blender.